… yes I do. I was getting frustrated while working on these projects with such cheap materials. … well I work with kids, so I can just tell them one of the students made it, hahaha. My second one took more time, more frustration (I cannot cut straight for some reason), meaning more cereal consumption (with all the toppings of course). ^Haha, of course the edges are going to be cut off and both will (HOPEFULLY) look better in a frame. I like this one better. It is inspired by something that is up at our church. I always wanted to try a tapestry thing like it and it was actually pretty fun! Blech. I’m kind of hoping we have some really nice frames to put them in, hahaha. Otherwise, it was fun working on these projects. Maybe I’ll actually go to the store and get some nice materials to make something? All I know is… I love bright colors. 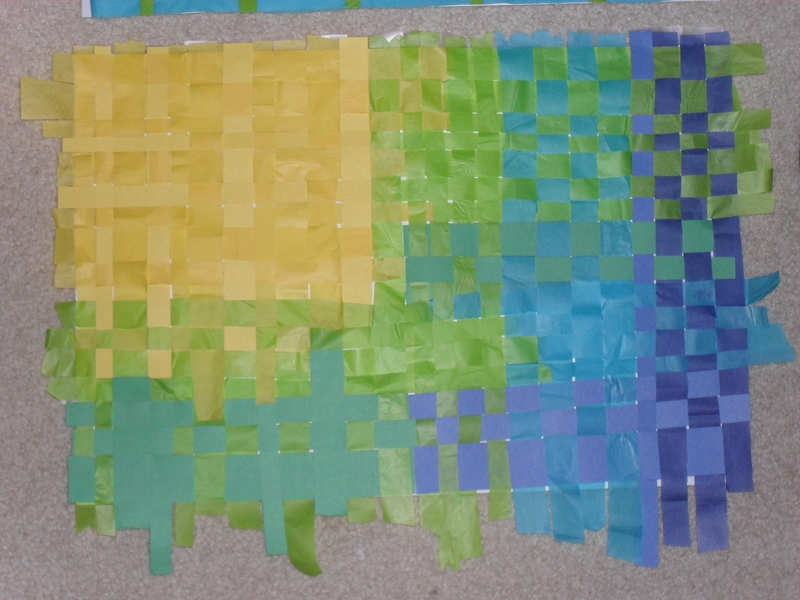 I also love tissue paper (I love when it overlaps and creates different colors/shades). Garsh. I’m kind of embarrassed about how much I ate last night… BUT today is a new day. I considered skipping breakfast to “make up for last night”… but I know that’s a bad idea. It usually ends in me plunging head-first into a colossal “snack” later in the day and the cycle continues. So this morning, I just ate a normal breakfast, and I’ll just get back on track with my healthy eating. I’M FINALLY GROWING UP, MA! I have two hours of work, then a two-hour lecture… then a three hour lab (which ends at 10:20pm). I’m hoping the lab will end earlier! Otherwise… it’s going to be a long day. I am considering whether to go to the gym for a quick sweat session before work. If not, I might just make today a rest day because I doubt that I will have the energy to go to the gym after my lab. If you had to pick one of the crafts projects that I made, which one would you pick?